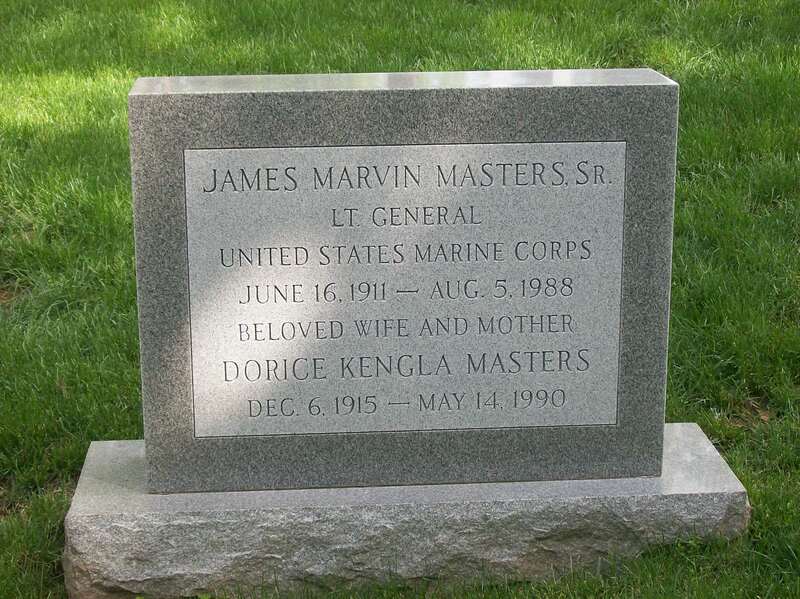 Lieutenant General James M. Masters, Sr., holder of the Navy Cross, and Distinguished Service Medal, died at his home in Washington, D.C. on 5 August 1988. "On 10 May, when the advance of the Regiment was checked by a strong hostile force, Lieutenant Colonel Masters unhesitatingly went forward of the front lines on reconnaissance and obtained information concerning the Japanese and unfamiliar terrain which enabled a successful attack to be made the following day. On 11 May, he established an advanced observation post in the only possible position on the front lines from which the attack that day could be observed and directed and, despite unusually heavy casualties at the post from intense enemy mortar and small-arms fire, continued to man it and report information vital to the capture of desperately defended Dakeshi Ridge." James Marvin Masters, Sr., was born 16 June 1911, in Atlanta, Georgia, and graduated from high school at Anderson, South Carolina. He attended The Citadel before entering the U.S. Naval Academy at Annapolis, in 1929. Upon graduation from the Academy, he was commissioned a Marine Second Lieutenant, 1 June 1933. Lieutenant Masters completed the Basic Course at the Philadelphia Navy Yard in May, 1934, and the following month began a year's tour of sea duty, serving with the Marine Detachment aboard the USS New Mexico. In July 1935, he joined the 1st Marine Brigade at Quantico, Virginia. He was promoted to First Lieutenant in July 1936. Lieutenant Masters remained at Quantico until January 1937, and the following month embarked for Shanghai, China, where he served with the Fourth Marines until November 1939. While in China, he was promoted to captain in September 1939. On his return to the United States, Captain Masters was ordered to the Marine Barracks, Washington, D.C., in December 1939, and later served briefly at Quantico. In September 1940, he was assigned to the Marine Corps Base, Parris Island, South Carolina, as a battery commanding officer with the 4th Defense Battalion. He was transferred with the battalion to Guantanamo Bay, Cuba, in February 1941, and in November 1941 embarked with the battalion for Pearl Harbor. On 7 December 1941, Captain Masters participated in the defense of that base against aerial attack. On 25 December he departed Pearl Harbor enroute to and in command of the first reinforcements for Johnston Island, where he remained until November 1942. The Bronze Star Medal was awarded him for service on Johnston Island. He was promoted to Major in May 1942. Major Masters joined the 10th Defense Battalion at Pearl Harbor in November 1942. Later, as Executive Officer of the battalion, attached to the First Marine Amphibious Corps, he served in the Solomon and Russell Islands. He was promoted to Lieutenant Colonel in April 1943. In August 1943, Lieutenant Colonel Masters joined the 2d Battalion, First Marines, 1st Marine Division, and served briefly in Australia prior to going into combat again in December 1943 and January 1944, as a battalion Commanding Officer at Cape Gloucester. Following this, he returned to the United States and, in March 1944, assumed duty at Marine Corps Headquarters with the Division of Plans and Policies, G-3. In September he was assigned detached duty at Pearl Harbor, and on Guam, Saipan and Tinian, Marianas Islands. 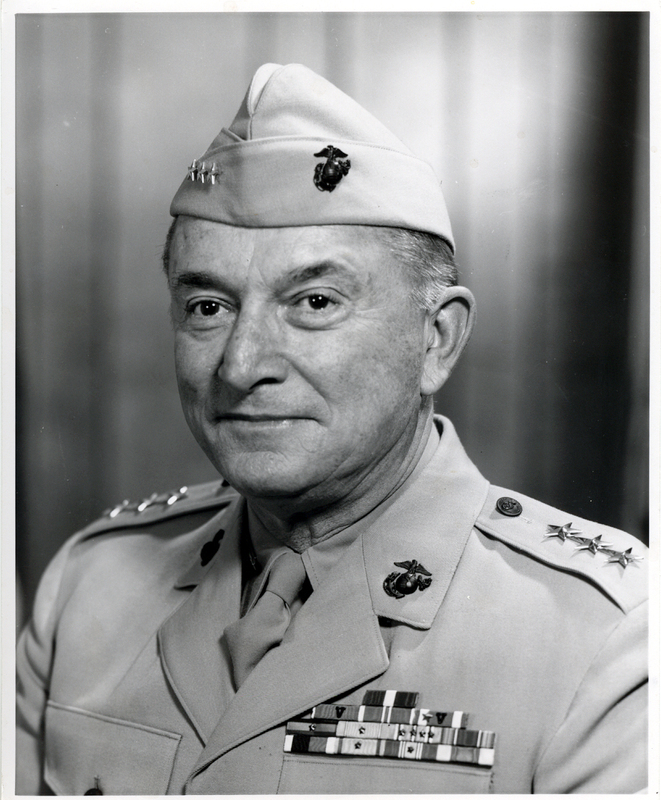 In November 1944, Lieutenant Colonel Masters was transferred to the Seventh Marines, 1st Marine Division. The following month, he began serving as Regimental Executive Officer at Pavuvu, Russell Islands. In this capacity he took part in combat on Okinawa, in April, May, and June of 1945, during which action he earned the Navy Cross. Ordered to Tientsin, China, in October 1945, Lieutenant Colonel Masters served with the 1st Marine Division as Assistant Chief of Staff, G-2, until March 1946, then returned to the United States. Upon his return, he was again assigned to Headquarters Marine Corps where, in May 1946, he began a two-year assignment in the Inspection Division. In May 1948, he was ordered to the Marine Corps Schools, Quantico, serving as Executive Officer, and later, Commanding Officer of the Basic School. He was promoted to Colonel in August 1949. Colonel Masters was transferred to Camp Lejeune, North Carolina, following this assignment, and assumed command of the Eighth Marine Regiment, 2d Marine Division in September 1950. He commanded the regiment for 18 months, then returned to Washington where he was enrolled as a student at the National War College from August 1952 to June 1953. The following month he became a member of the Joint Strategic Plans Group, Joint Staff, Officer of the Joint Chiefs of Staff, serving in this capacity for two years. In August 1955, Colonel Masters assumed duty as Regimental Commander of the Fourth Marines (Reinforced), 3d Marine Division, at the Marine Corps Air Station, Kaneohe Bay, Hawaii. He commanded this regiment until he was named Fleet Marine Force Pacific Liaison Officer to the Commander in Chief, Pacific Fleet, in Hawaii, in June 1956. While serving in this capacity, he was promoted to Brigadier General in July 1957. General Masters reported to Headquarters Marine Corps as Assistant Chief of Staff, G-2, in September 1957. He was assigned additional duty as Inspector General of the Marine Corps in June 1960, and was promoted to Major General the following month. He continued in the post of Inspector General of the Marine Corps from August 1960 until July 1961. Transferred to the West Coast, General Masters assumed command of the 1st Marine Division (Reinforced), Fleet Marine Force, at Camp Pendleton, California, 31 July 1961. He served in this capacity until June 1962, when he became Commanding General, Marine Corps Base, Camp Pendleton. Following the latter assignment, he arrived on Okinawa in May 1963, and served as Commanding General of the 3d Marine Division until becoming Commanding General of the 3d Marine Division until becoming Commanding General, Marine Corps Recruit Depot, Parris Island, South Carolina. A Gold Star in lieu of a second Navy Commendation Medal was awarded General Masters for "…meritorious conduct in the performance of outstanding service as Commanding General, Marine Corps Recruit Depot, Parris Island, South Carolina, from 19 June 1964 to 15 June 1966." Following his promotion to lieutenant general on 1 July 1966, he was assigned duty as Commandant, Marine Corps Schools, Quantico, Virginia. In January 1968, Marine Corps Schools was redesignated Marine Corps Development and Education Command, and General Masters' title was changed to Commanding General. He thus became the first Commanding General of the Marine Corps Development and Education Command and the last man to fill the billet of Commandant, Marine Corps Schools. General Masters was presented the Distinguished Service Medal by the Commandant of the Marine Corps, General Leonard F. Chapman, in retirement ceremonies held at Quantico, 28 June 1968. A complete list of his medals and decorations includes: the Navy Cross, the Distinguished Service Medal, the Legion of Merit with Combat "V", the Bronze Star Medal, the Navy Commendation Medal with Combat "V" and Gold Star in lieu of a second award, the Presidential Unit Citation, the China Service Medal with one bronze star, the American Defense Service Medal with Base clasp, the Asiatic-Pacific Campaign Medal with one silver star, indicative of five bronze stars, the World War II Victory Medal, the National Defense Service Medal with one bronze star, the Chinese Order of the Cloud and Banner, and the Korean Order of Service Merit Second Class. The President of the United States takes pleasure in presenting the Navy Cross to James M. Masters (0-4874), Lieutenant Colonel, U.S. Marine Corps, for extraordinary heroism as Executive Officer of the Seventh Marines, FIRST Marine Division, in action against enemy Japanese forces during the assault on Dakeshi Ridge, Okinawa, Ryukyu Islands, from 10 to 12 May 1945. On 10 May, when the advance of the Regiment was checked by a strong hostile force, Lieutenant Colonel Masters unhesitatingly went forward of the front lines on reconnaissance and obtained information concerning the Japanese and unfamiliar terrain which enabled a successful attack to be made the following day. On 11 May, he established an advanced observation post in the only possible position on the front lines from which the attack that day could be observed and directed and, despite unusually heavy casualties at the post from intense enemy mortar and small-arms fire, continued to man it and report information vital to the capture of desperately defended Dakeshi Ridge. Moving the observation post forward again on 12 May, he advanced under intense hostile fire to the Ridge before that ground had been completely seized by assault troops and, although the Japanese continued to inflict heavy casualties on his force, persevered in his mission to observe the enemy and terrain, thus securing information which aided materially in the formulation of successful plans for continuing the attack. His inspiring leadership, courage and unremitting devotion to duty throughout were in keeping with the highest traditions of the United States Naval Service.